GATEWAY ACADEMIC PROGRAM - The "Invisible Gold Mine" Many institutions of higher education and high tech companies look for students and/or workers in overseas countries like India and China for math and science and math-related fields. During the 2006 summer GAP program, two out of 12 students (17%) decided to major in physics. In 2007, five out of 16 (31%) of the students majored in math, physics, and chemistry. In 2009, during the interviewing process, eight out of 16 students (50%) indicated their interest in math and science fields . It is clear that the urban high schools are the "Invisible Gold Mines" for recruiting students in math, science, and math-related fields. The problem is we just need to know how to prepare them for these fields. GAP can help to achieve this outcome. Many institutions of higher education and high tech companies look for students and/or workers in overseas countries like India and China for math and science and math-related fields. During the 2006 summer GAP program, two out of 12 students (17%) decided to major in physics. In 2007, five out of 16 (31%) of the students majored in math, physics, and chemistry. In 2009, during the interviewing process, eight out of 16 students (50%) indicated their interest in math and science fields . It is clear that the urban high schools are the "Invisible Gold Mines" for recruiting students in math, science, and math-related fields. The problem is we just need to know how to prepare them for these fields. GAP can help to achieve this outcome. GAP was first reported in The Washington Post in 2007. Since then, it has been covered in several other newspapers -- The Northwest Current, The Kansas City Star, The Final Call. In October 2009, it appeared as a cover story in Diverse, a bi-weekly national magazine. UDC Counteracts Damage Wrought by D.C. SChools--The Washington Post (10/07/2007) "The students entered an academic boot camp unlike anything they had ever seen. On the first day, Khatri announced the rules. 'No cellphones in class. No napping. No eating. You may not leave the room. No closing eyes, head on the table or putting feet on a table.' 80% of these students tested out of remedial courses in math ... ."
UDC Math Program Helps Students Catch Up--The NorthWest Current -- (8/22/2007) "There he was looking forward to a relaxing summer. Davis reluctanly enrolled in the course. After eight weeks of four-hour classes five days a week, 'it was worth it,' he said, 'I am really glad I did it.' ... It is a problem of schools all over ... ."
If You Teach Them, They Will Learn -- Independent Women's Forum (11/8/2007) "I suspect that one reason so many schools fail is that teaching, really teaching, is hard work." "Professors Brenda Brown, Anne Hughes and Daryao Khatri at The University of the District of Columbia (UDC) have devloped the GAP program to increase success ..."
It's Worth Trying to Save Every Student--The Kansas City Star -- (8/23/2009) "About 30 percent of college freshmen require some remedial courses. In some colleges and universities, the number is as high as 95 percent. Because of summer courses, many of them have avoided remedial courses ... Student achievement is phenomenal. This year [summer 2009] 54 percent of the students tested out of remedial math courses; 44 percent tested out of the remedial reading and English courses. That saved the students a year in remedial work." America's Educational System-- Still Lagging Behind--The Final Call (9/7/2009) “The Gateway Algebra Program (GAP), which in just four years has become a nationally recognized eight-week summer crash program to help inner city high school students avoid first-year remedial math and help them chart science career goals ... ."
GAP Program Aims to Improve Education in L.A.-- The South Los Angeles Report. (12/04/2009) "It [GAP] was first introduced in urban Washington, D.C. schools and helps students complete classes in remedial math, reading and English so they can focus on career courses and advanced studies. GAP advocates spoke to educators in L.A. on Thursday [12/4/2009] about their system for helping struggling high schoolers. " Destigmatizing Remedial Education -- Washington Monthly (10/20/2009) "She and her cohorts selected for the GAP had posted the lowest scores in English and math of all entering freshmen who took the original placement tests. By the end of the eight weeks of rigorous classroom work aimed specifically at the deficiencies found in her first tests, she was tested again and her performance on the second tests cleared her to enter the school as a full-fledged freshman." 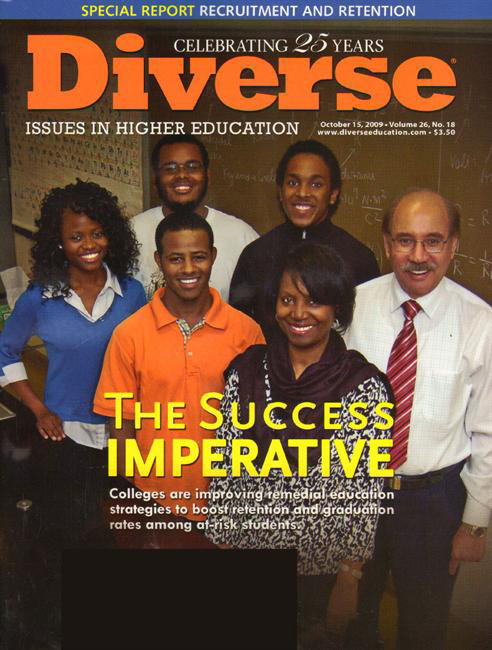 Reinventing Remedial Education--Cover story in Diverse, a national bi-weekly magazine (10/15/2009) "Pushed to go beyond providing access, colleges refocus on developmental education to improve retention of at-risk students. Remediation won't work if you teach them the same thing in the same way as in high schools. The nation's high schools in urban cities are 'Invisible Gold Mines' for recruitment of minority students in math and science... .